Class which manages grid generation. This class manages grid generation from sets of tagged cells. It is designed to be a pure virtual base class from which another class may be derived with a specific grid-generation algorithm (for example, the BRMeshRefine class). There are two ways grids can be defined based on tagged cells. one takes a single IntVectSet of tags defined on the BaseLevel mesh and uses that set of tags for every level to be refined; the other takes a Vector<IntVectSet> of tags defined on all the mesh levels to be refined and uses those. Create new meshes based on tagged cells on a range of levels of a mesh hierarchy. Each level of tagged cells is used to generate a new mesh at the next finer level. The finest level in the output mesh will be one level higher than the top of the range of levels given as input. As a special case, use the same tags (appropriately refined) for all levels. Call the regrid functions after computing error estimates and tagging cells. To add a new mesh level, set TopLevel to the index of the finest level in the existing mesh and define tags on the finest level. To keep the existing number of mesh levels, set TopLevel to one less than the index of the finest level and don't define any tags on the finest level. If a single IntVectSet of tags is passed (instead of a Vector<IntVectSet>) then the same tags (properly refined) will be used for all the new meshes up to level TopLevel+1. In any case, the meshes at levels BaseLevel and below are not modified. The output argument newmeshes will be reallocated to the necessary size before being used. When this function returns, the elements of the newmeshes vector corresponding to the unchanged levels will be filled in with copies of the levels from the old mesh vector. The variable tags is modified in an undefined way, so its contents should not be relied upon. The variable BlockFactor specifies the amount by which each box will be coarsenable. Every grid box will have an integral multiple of BlockFactor cells in each dimension and also lower index values that are integral multiples. As a side effect, the minimum box size will be BlockFactor. Expensive validations are done only when debugging is enabled (i.e. the DEBUG make variable is "TRUE"). All the input vectors should be defined with max index >= TopLevel. They should have values for indices [BaseLevel:TopLevel]. (except for OldMeshes, which must be defined for all indices). The new mesh vector newmeshes will be redefined up to index TopLevel+1. RefRatios should be defined such that RefRatios[L] is the value to use to refine the level L mesh to produce the level L+1 mesh. The tags vector is modified in an undefined manner. 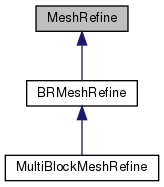 The output variable newmeshes may not be completely defined if an exception occurs. The BlockFactor can be used to force a minimum box size. has this object been defined properly? sets proper nesting region granularity. set each component to 1 or 0 according to whether or not we refine in that direction. Default IntVect::Unit. returns IntVect with component d set to a_val if m_refineDirs[d] == 1; else 1.
a_maxSize maximum grid length in any direction -- 0 means no limit. This function creates a hierarchy of grids from a single level of tags on BaseLevel. If tags exist, then all levels will have grids. Returns the new finest level of grids. If m_refineDirs != IntVect::Unit, then a_tags and a_oldMeshes must have ranges restricted to 0 in all dimensions d with m_refineDirs[d] == 0, and the output a_newmeshes will have this same restriction. This function creates a hierarchy of grids from tags at all refinement levels. It is possible that not all levels will return with grids, since there may not be tags at all levels. Returns the new finest level of grids. constructs a set of boxes which covers a set of tagged cells by using the algorithm of choice. Everything should be on the same level, and blocking factor is not applied. Boxes will be on the same refinement level as the tags. This would normally be a protected function, but it can be useful to call it on its own, so it has been left public. This function computes values for m_local_blockfactors array, which is the amount that tags on a level are coarsened in order to guarantee that the grids on the next finer level are coarsenable by the BlockFactor.